81 Runton Road01263 715779work01603 870304fax Self-catering This semi-detached property is the perfect family holiday home, built in the 1930's this property has the added luxury of extensive sea views. Set in the outskirts of this lovely seaside town, all the amenities are just a short distance away. • Luxuries: Flat screen TV, DVD player, iPod dock. • Rooms: 4 Bedrooms, 1 Bathroom, 2 cloakrooms, Sitting room, Dining Room, Kitchen. • Other: Towels available for hire @ £10 per person. Books and Games, stairgate. • Outdoors: Fully enclosed front & back garden with lawn. • Access: Designated parking at the rear of the property for two cars. 81 Runton Road offers weekly bookings starting on Saturday. This semi-detached property is the perfect family holiday home, built in the 1930's this property has the added luxury of extensive sea views. 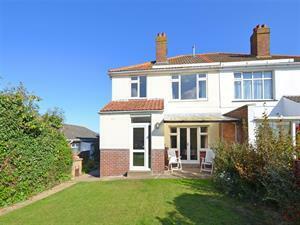 Set in the outskirts of this lovely seaside town, all the amenities are just a short distance away.